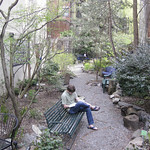 Located at 530 East Sixth Street, between Avenues A & B, the Creative Little Garden has been an oasis of tranquility in New York's East Village since 1978. 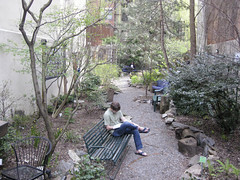 It's a "community backyard," maintained by volunteers from the surrounding neighborhood. There are no plots tended by individual gardeners, instead members collaborate on the landscaping of the whole park. Everyone, not only members, can relax, read, have lunch, work on your laptop or just enjoy the sights, sounds and smells of our garden...or you can hold a scheduled private event.